Storytelling has been used for millennia to share ideas, entertain and inspire. 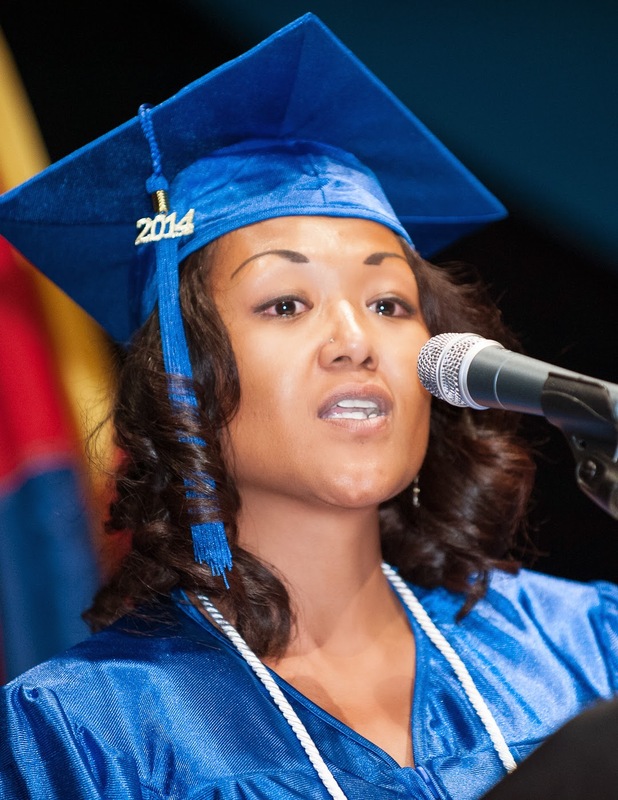 Attendees of the Rio Salado College 2014 Commencement on May 6 at Comerica Theatre experienced the awesome power of storytelling, especially from student speaker Kaisi Balmer, who captivated the audience with her personal story. Balmer gives new meaning to courage. She came to Rio Salado four years ago on the recommendation of a friend. At the time, she was homeless, unemployed, addicted to drugs and disconnected from family and friends. Through faith, determination and the help of others, including a Rio Salado academic advisor, she mapped out a plan to pursue her true dream of becoming a doctor. Balmer received her Associate in Arts diploma during the ceremony and plans to continue her studies this fall at Arizona State University to earn a degree in global health, and ultimately become a missionary family practitioner. Also among the graduates in the audience was Virginia Lee Contreras. At age 62, Contreras has had a lifetime of experience in the field of early childhood education and currently works for the Maricopa County Head Start program. 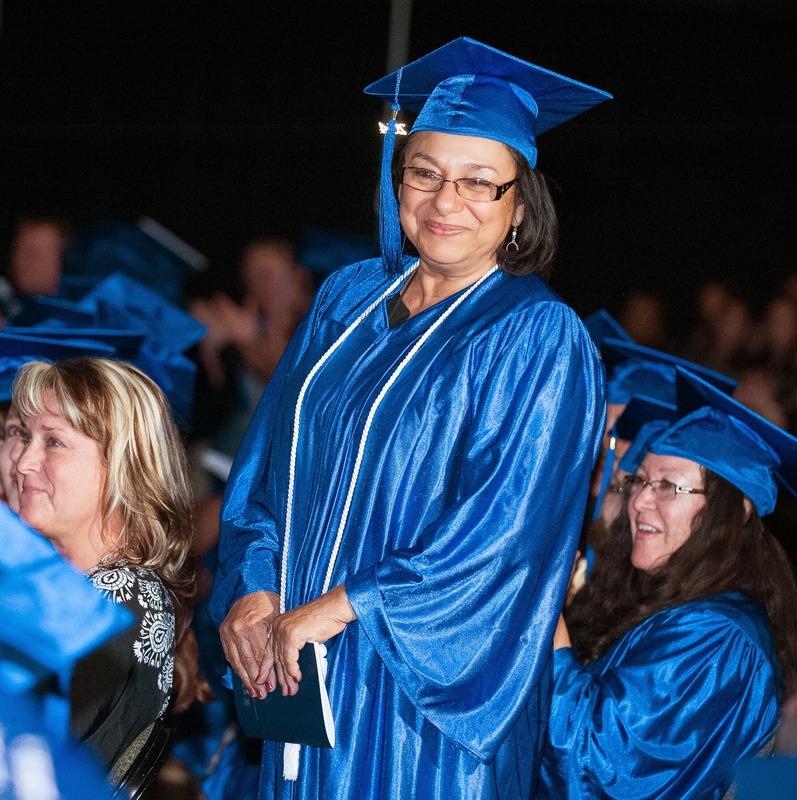 She began her college education 44 years ago but said, “life got in the way.” When she received her Associate Degree in Early Childhood Education and Human Development, it was a lifelong goal finally realized. She plans to pursue a bachelor’s degree and continue serving as a role model for her son who is also a returning student. Joining Contreras were 12 dual enrollment students from the Tempe Union High School District’s Corona del Sol, Desert Vista and Mountain Pointe high schools and Xavier College Preparatory. More than 6,700 students have earned high school and college credit simultaneously at 41 partnering high schools in this last year. 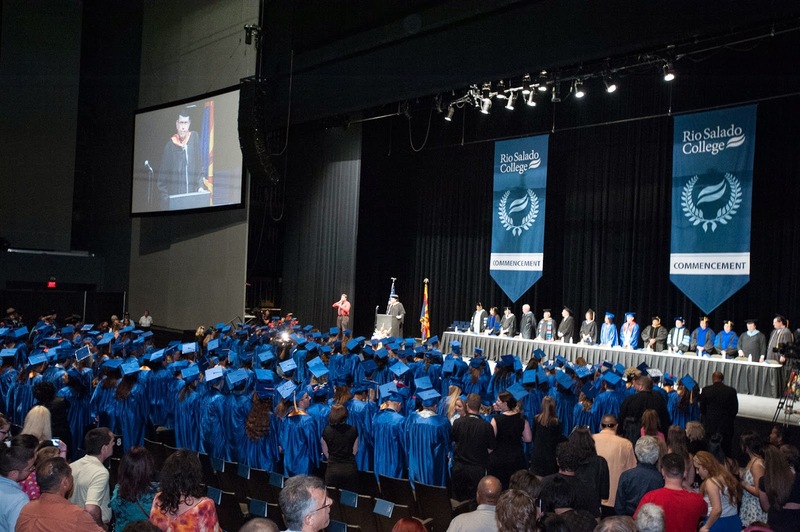 These graduates, however, have gone the extra, extra mile to supplement their dual enrollment courses with online courses at Rio Salado to earn an Associate Degree-- before completing high school. Included in the dual enrollment cohort was Briana Corinne Bustamante. Her father is Dr. Chris Bustamante, President of Rio Salado College. It is likely Commencement 2014 will be included in the Bustamante family stories for years to come. Dr. Bustamante knows about the power of storytelling all too well, especially when it comes to inspiring people and creating positive change, which is why he called on students to take part in this age-old tradition. There are many people in our community who have yet to accomplish what you have achieved tonight and we don’t want to leave anyone behind. It’s up to you to encourage someone in your family, or circle of friends, to pursue an education. Make it your personal mission to help them plan for the future. Tell them your story! Share your success, your knowledge, and your experience with those who are seeking to reshape their lives. You are the best role models. You can set an example; be a mentor and make a positive difference in the lives of others. *Count at time of publication.